We booked this cruise back in May 2014, as we wanted to be sure to get onboard during the October half term. The purpose of the holiday was to celebrate Ellena’s 60th birthday in September, and mine in October, and we wanted to take the family with us. We wanted to cruise from the UK and, as our grandchildren are aged 7 and 4, it was important to choose a family friendly ship. We therefore opted for Ventura, which had a 7 night cruise to Spain, Portugal and France, which fitted the half term dates perfectly. 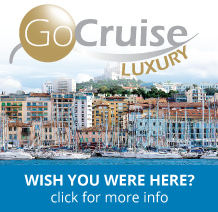 Please take a look through my review, watch the videos and click on the following link for my Ventura photo album on Facebook, then call GoCruise with Ian on 08002922850 or 01455821770 to book your next cruise, or to get further information. At 116,000 tons, Ventura is the second largest ship in the P&O Cruises fleet, after Britannia. She was built in 2008, but has been regularly refitted and refreshed since then. At normal operating capacity she carries around 3,100 passengers and just over 1,200 crew members. There are 35 grades of accommodation, ranging from a single inside cabin, up to the penthouse suite. In between these you will find outside cabins, balcony cabins and superior deluxe cabins. Some cabins do have obstructed or partially obstructed views, while others might have a metal front to the balcony, rather than glass, and some balconies can be partially shaded or overlooked. I take special care to point out these anomalies to my customers because, while some people won’t mind, others would rather pay a little bit more to know that they will get what they really want. There are a number of pools and whirlpool spas on the open decks, as well as a good supply of sun loungers. The Beachcomber pool on Lido Deck has a retractable ‘Skydome’ roof, making the pool useable in any weather. You will also find deck games, such as shuffleboard and quoits, on the Sun Deck. There is a sports court, golf nets, a well-equipped gym, as well as a large spa offering a comprehensive range of treatments. If you are feeling a bit thirsty, then many of the bars will be open during the day, to try a cocktail or perhaps a cold beer. There is a 2-deck high theatre, which will stage production shows, and also doubles as a cinema, as well as two show lounges for tribute acts, comedy, cabaret and dancing. There is a great choice of bars around the ship, including Metropolis on Sky Deck, which has a panoramic video wall, showing the skyline of a different city each evening. Fortunes Casino is on F Deck, if you fancy a game of roulette or trying your luck on the machines. The Headliners Theatre Company performed very different shows on 3 nights, and is one of the best resident groups of singers and dancers I have seen on a cruise. The visiting cabaret acts were also very good, especially Gareth Oliver. He is a comedy ventriloquist, and is well known for his appearance on Britain’s Got Talent. I know that it serves me right for sitting in the front row of the theatre, but I ended up on stage as his ‘dummy’. There is a short video clip included in my video of the ship but you can also watch the following video which is longer. Please don’t laugh too much! Your cruise is on a full board basis, including breakfast, lunch and dinner, as well as afternoon tea, snacks, deck barbecues and the 24 hour buffet. You will also find that there is a good selection of items available free of charge on the room service menu. Breakfast was available in the Bay Tree and Saffron Restaurants, as well as the Beach House and Waterside self-service restaurants, on an open-sitting basis. Lunch was the same as breakfast, but not available in the Bay Tree Restaurant. Club Dining – you opt for either first sitting (c6.30pm) or second sitting (c8.30pm) and you will be allocated a table in the Bay Tree Restaurant. This will be the same for each evening of the cruise. Freedom Dining – you will eat in the Saffron or Cinnamon Restaurants, but can turn up at a time to suit you between 6.00pm and 9.30pm. If the restaurant is particularly busy when you arrive, there may be a short wait until you can be seated, but you will be given a pager. Select Dining – you may also wish to try one or more of the speciality restaurants, perhaps to celebrate a special occasion, but please note that a cover charge will apply. On Ventura these venues include The Epicurean fine dining restaurant, Atul Kochhar’s Sindhu, Olly Smith’s The Glass House, and The Beach House (evening only). Ventura is a family friendly ship, and offers a range of clubs and activities to keep children of all ages occupied and happy. The Reef children’s club is staffed by qualified DBS-checked Reef Rangers, and is split down into 4 different age groups. The children’s clubs are free, and take place every day and early evening, on a first-come, first-served basis. Please note that occasionally, perhaps on cruises with not many children onboard, the age groups may be combined to 2-8 and 9-17. The clubs are open longer on sea days than they are on port days, and opening hours are advised onboard. There is also a night nursery for children aged between 6 months and 4 years, and it is generally open from about 6pm until 2am, with spaces being available on a first-come, first-served basis. Again times are subject to change, and will be advised onboard. We were onboard for the half term, and there were 600 children onboard. I have to say though that I would never have guessed there were that many, if we hadn’t been told. I think the reason is that the clubs have so much for them to do, that they actually want to be there. Our granddaughter was in Surfers and our grandson was in Splashers, and they both had a great time. In fact they didn’t always want to come away. Another passenger told me that he went to collect his son at 10pm, and was told that he was busy watching a film, and to come back for him in an hour! There are a number of shops for anyone who likes retail therapy, selling a variety of items ranging from sweets and toiletries to clothing and jewellery. You will also find a library, internet room and photo gallery. Please note though that if your cruise doesn’t call at a non-EU country, then VAT of 20% is added to most purchases in the shops. You should always be able to find yourself somewhere quiet around the ship to sit and read a book, if that is what you want to do. There are also a number of self-service launderettes onboard, although you can of course pay to have clothes laundered or dry-cleaned. As with the other ships in the fleet, the onboard currency is sterling, so no conversions to do in your head to work out what something costs. Drinks are priced reasonably onboard, for instance on our cruise the following applied £4.25 for a pint bottle of Magners, £3.95 for a pint of draught Stella Artois, Carling or John Smith’s Extra Smooth, £3.00 for a 25ml measure of Gordon’s Gin, Bells Whisky, Smirnoff Red Vodka or Captain Morgan’s Dark Rum, £1.95 for a regular Pepsi or diet Pepsi, and wine started at £14.95 a bottle in the restaurant. Unlike some cruise lines, no service charges are added to these prices. Gratuities of £5 per person (aged 12 or over) per night are added to your onboard account, which covers tips to your cabin and dining room stewards. You can have this amount amended at reception onboard if you wish. The ship works on a cashless system, so all purchases are charged to your onboard account. Although the cost of your cruise includes meals and entertainment, chargeable items include drinks, speciality dining venues, shop and spa purchases, photographs, shore excursions and gratuities. We all had a great holiday, with something for us all to do. 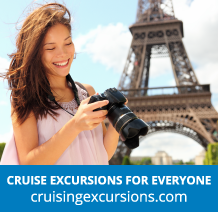 Cruising really is a great holiday choice for multi-generational families, as you can meet up when you want to, perhaps for meals or shows, and everyone can do what they want for the rest of the time. The food and service was very good although, to be honest, the food wasn’t quite as good as I remember it in previous years. I also thought that overall the entertainment was excellent and varied. Depending on where you live in the country of course, price for drinks are similar to many pub prices. P&O Cruises is still a traditional British cruise line, with ships aimed at the British Market. The onboard currency is sterling, you get tea and coffee making facilities in every cabin, and the electrical sockets in the cabins are for UK 3 pin plugs. If I had to pick on a negative, then it would probably be the same as with most other cruise lines, and that is the very high cost of using the internet. Overall we all had a great time, and it was nice to spend a whole week with our family. If you would like details of cruises on Ventura, or any other ships in the P&O Cruises fleet, give me a call, and I will be happy to help.